The month of July was, in one word, average; however, as usual, one word doesn't describe the Nebraska weather very well. Some locations received extreme rainfall (6-7”+), or lack thereof (less than 1”), or severe weather (9 tornado, 38 hail, 75 wind reports), but as a state, it was about as average as it comes. During the summer, “average” is usually the average of two extremes anyway and we did it again. Central and East Central Nebraska received much above normal precipitation, but most other locations were near to below normal (Figure 1). Temperatures were variable and were below normal for the “wet” areas and above normal for the “dry” areas. I say that loosely because most of the state is neither too wet or too dry (Disclaimer: we do have some very wet and very dry areas). The latest “Greenness” map (Figure 2), shows most of the state on July 19-25 was slightly “greener” than normal, except for parts of NW Nebraska. For the region, most everyone east of Nebraska received above normal precipitation, except for some areas around the Great Lakes where they remained dry. Temperatures were slightly warmer than normal for the Great Lakes, but variable for the rest of the area. The drought monitor is showing D1-Moderate Drought conditions around Hastings up through Central City, as well as around Scottsbluff through Chadron. These areas have been expanding recently, so is definitely worth monitoring. 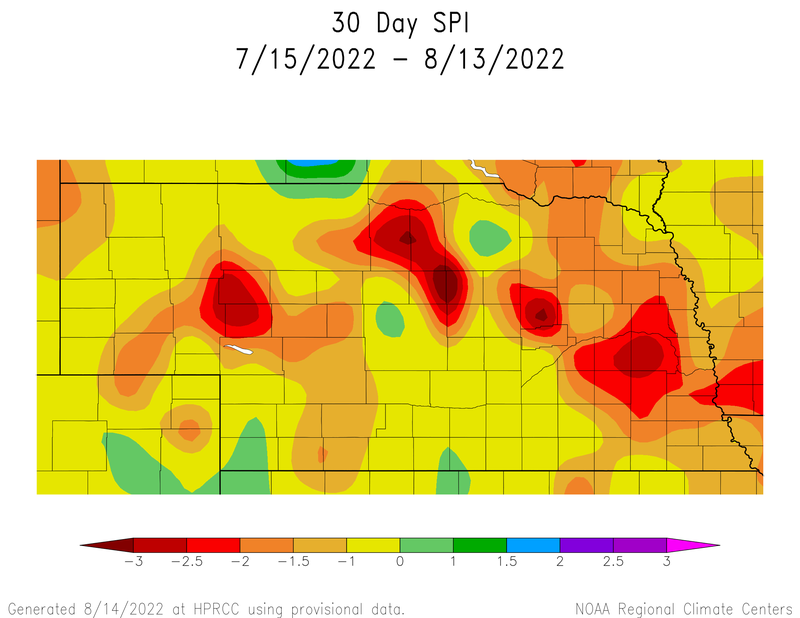 The 30-Day SPI (Standardized Precipitation Index) is not showing a strong signal for drought conditions, but the 60-Day SPI is showing very dry conditions along the southern tier of Nebraska from Minden through Beatrice. 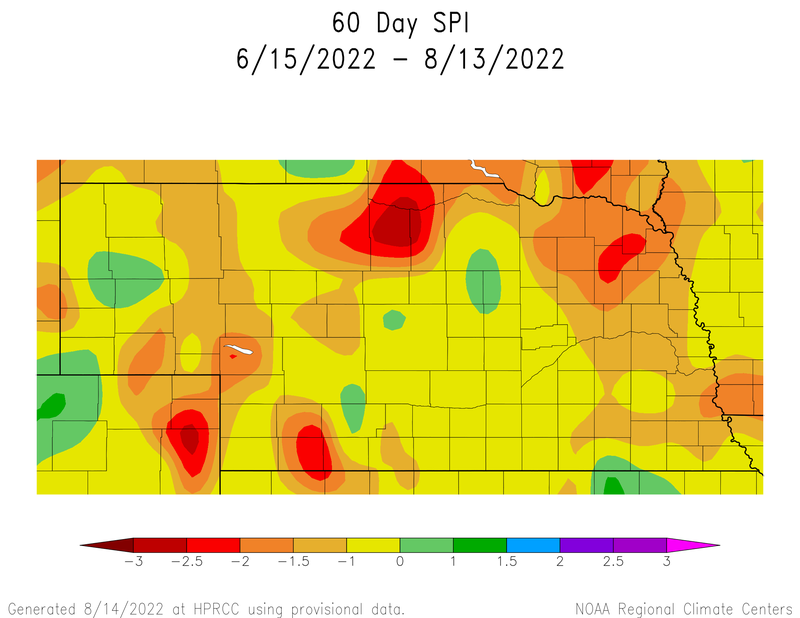 This would suggest July provided near normal conditions for these dry areas, but did not make up for June. In general, the forecast is positive from a growing conditions perspective. Temperatures look to be mostly moderate and precipitation is likely. A cold front will move through on Thursday and will cool temperatures considerably from earlier in the week. This will drop high temperatures 10-20°F and we may experience a couple days of highs in the 70s and maybe low 80s. Temperatures will start to climb back up on Sunday and Monday. We will also have multiple opportunities for precipitation with the passage of the front and moderation of the ridge that has been over the middle of the U.S.
For the next week or two, temperatures are expected to remain moderate and near normal for this time of year, which can still be quite warm. We will warm back up next week with flow from the southwest and will probably warm from west to east. The models are showing multiple shortwaves move through the northern plains and could keep the very warm temperatures to our south. It will also allow more chances of precipitation over our state. We have been in this pattern of waves moving through the region and it could continue. The 6-10 Day and 8-14 Day Outlooks from the Climate Prediction Center (CPC) are showing similar patterns. 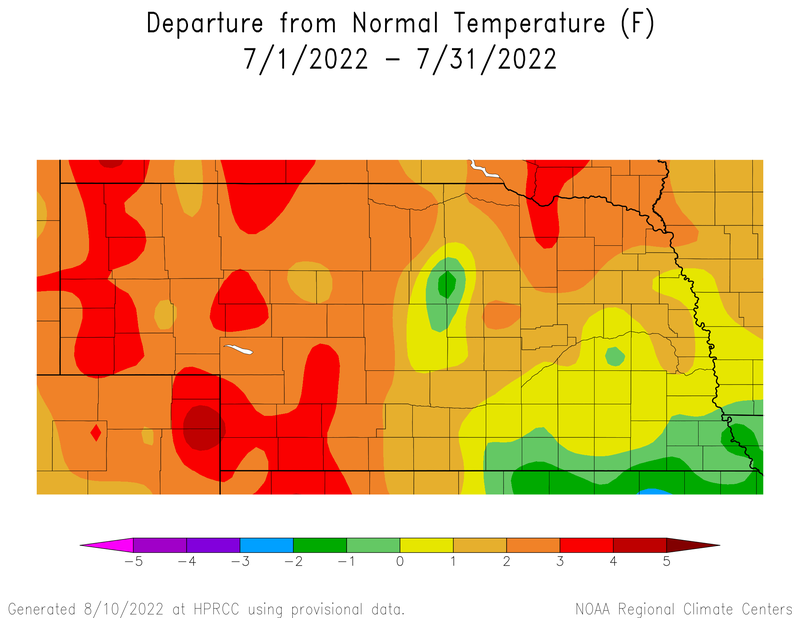 They are expecting near to below normal temperatures for most of the western U.S., but Nebraska will be in the transition zone of near or above normal temperatures. This will depend on the amplitude of next weeks ridge, but the models have been fairly poor in predicting temperature trends out past seven days. 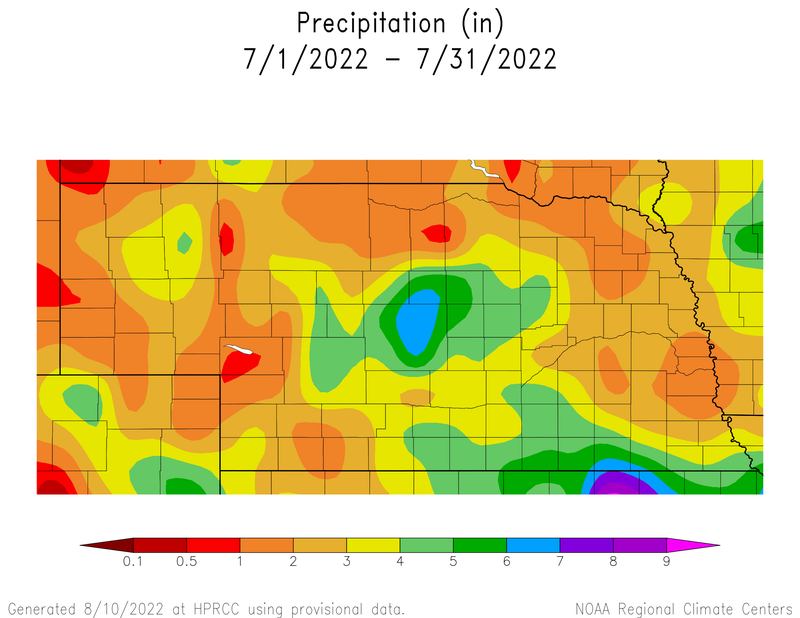 The northern plains and Midwest, including parts of Nebraska, have increased chances for precipitation the next couple weeks. 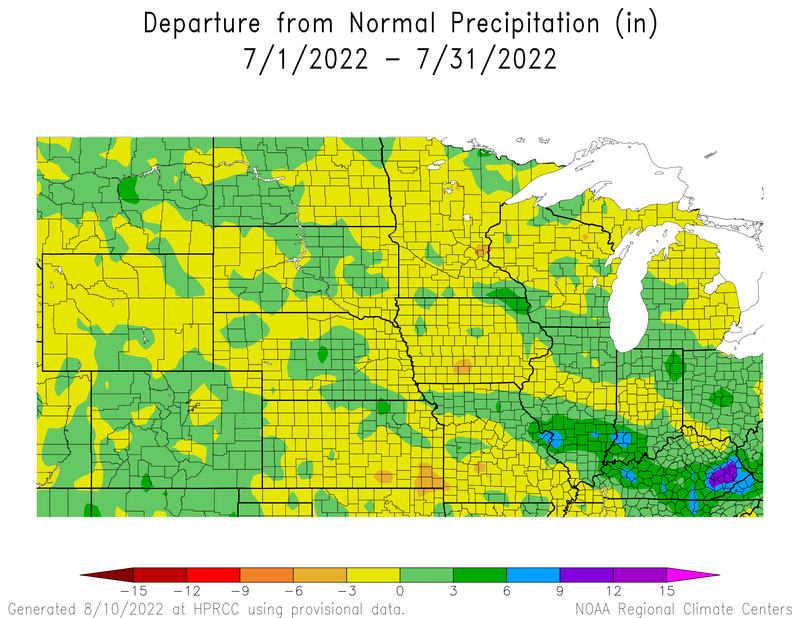 The one-month outlook (Figure 4) is indicative of continuation of this precipitation trend with increased odds for above normal precipitation for much of Nebraska and the Corn Belt. The long-term outlook for the next few months has been changing with the decreased odds for a strong La Niña. 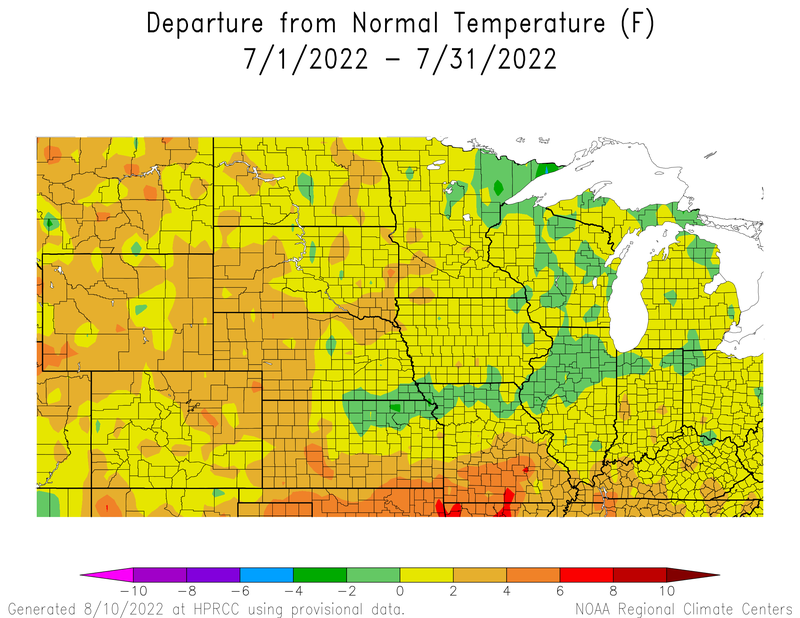 The CPC is showing increased odds for above normal precipitation for the northern plains and a blanket of increased odds for above normal temperatures for the U.S. (Figure 4). This temperature outlook is most likely following the trend of a warmer U.S. over the past year. The expectation of La Niña is getting later in the calendar year and most likely will be a weak La Niña. This is quite a shift considering this past spring many people thought we would quickly transition into a moderate La Niña and could see some growing season impacts. That didn’t happen and the trend is for it to have even less of an impact. We may see some impact this winter, but we will see how it progresses.